The Terminator must fight his way out of a city-sized zombie horde. Who triumphs? So anyway, I have to go to bed now. So here's some amusing little thing that took me a few minutes to pinch out. I even made the poll neverending this time. You're welcome. Same as the last time, half the battle of a typical Deathmatch is in open debate. State your arguments as logically, eloquently and convincingly as you can in order to support your choice and/or undermine the competition, and may the best combatant win! The Terminator's search for Sarah Connor has led him to the heart of Raccoon City, a city roughly the size of Boulder, Colorado (or Canberra, Australian Capital Territory, for those of you tuning in from the opposite side of the planet). Unfortunately, the Terminator's mission has run into a bit of a snag; a rapidly spreading biological agent has reduced the local citizenry to mindless engines of ruin, and they will converge on any uninfected lifeforms--including the Terminator--with intent to dismember and consume. At this stage, the Terminator's continued survival is paramount to the mission. Sarah Connor will have to wait. • Superior intelligence, full cognition and onboard analysis and computation. • Ability to pick up practically any weapon and wield it effectively. • Inability to feel pain. • Superior accuracy with ranged weapons (even to the point of placing individual shots from full-auto weapons and shooting through opaque barriers with some degree of precision). • Finite amount of scroungeable weapons and ammunition. • Computer's limited ability to improvise in crucial situations. • Singlemindedness may lead the Terminator to ignore environmental hazards or other threats. Umbrella Corporation sought to create the perfect viral agent for biological warfare. And they succeeded...all too well. When they created the T-Virus and permitted it to escape its controlled conditions, they unleashed a monster which they could not control. Before long, almost the entirety of Raccoon City--with a population somewhere around 300,000--had been overrun with the T-Virus, reducing any Infected to mindless yet nigh-unkillable shamblers with a complete tolerance for pain and an appetite for living flesh. And now they have found the Terminator, the perfect union between flesh and machine. And they will not hesitate to swamp the Terminator with sheer weight of numbers and pull his robotic endoskeleton apart to devour every last morsel of his flesh. • Superior endurance; can soak up barrages of small arms fire without dying. • Though slow, capable of lunges and brief bursts of speed when attacking. • Strength in numbers...considerably vast numbers. • Contagious; constantly adding new zombies to their numbers as they continue to come into contact with uninfected individuals. • Slow; diminished motor function. • Mindless; diminished cerebral function and limited ability--or complete inability--to operate machines or wield weapons. • Gunshots or blows which damage the brain can still kill zombies quickly and efficiently. • One hallmark of the Resident Evil universe? Guns. Lots of guns. And a noticeable lack of melee weapons. The protagonists of the RE games and (wretched) movies typically survive through a combination of shooting all the zombies and mutants dead, and running their butts off. And the Terminator is supposedly superior to a human gunman as far as accuracy and prediction of effect. 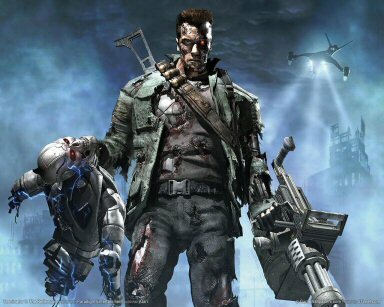 So anything that Jill Valentine can do, the Terminator can do better. • ...except for running. For all his (or its) advanced technology, the Terminator's ground speed is no better than that of a human. It wasn't until the release of the T-1000 (in Terminator 2) that we found a Terminator who could run fast enough to overtake a motorcycle (or at least a motorcycle that was just taking off). Sure, we had T-800 endoskeletons running fast enough to catch up with John Connor's truck in that shoot-em-up arcade game, but the video games aren't quite canonical. And our combatant here is a T-101 anyway. He can't run fast enough to play thread-the-needle with zombie mobs. They will surround him sooner or later. Ask any Resident Evil veteran: it's all too easy to get cornered and mobbed to death by zombies. The Terminator is physically strong and durable, but so are his enemies, to a slightly lesser degree...and there are a whole lot more of them. There may not be any Lickers, Hunters or--saints forbid--Nemesis himself in this Deathmatch, and that's fortunate...because the Terminator will have his hands plenty full as it is. • Another hallmark of the Resident Evil universe? A distinct lack of ammunition. The Raccoon City police and the Umbrella mercs already blazed through, like, 95% of the bullets in the entire city, and the zombies mulched 95% of the cops and mercs anyway. Wanna find cartridges for that awesome Mossberg shotgun you just found, Terminator? Good luck. Your boomstick's pretty useless without them, huh? » Jane Read Or Polly Esther?